During the past three decades, many metal operations have been moving away from U.S. manufacturers, but we held strong. We hired a group of really talented people who had been laid off by a competitor and bought the equipment we needed to keep ‘Made in the USA’ a real thing. Today Fotofab provides a full range of metal bending and forming services on a rapid delivery basis. Fotofab manufactures all of our own tooling in-house so that we control quality and lead times. Our system of forming utilizes simple tooling which can be built quickly and inexpensively. 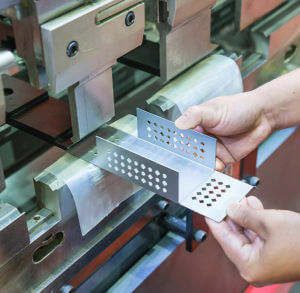 Rather than making costly progressive dies, tooling is broken up into multiple stations, with each stage performing an individual operation such as a single bend. These stations can be made in parallel, saving time. We want to provide feature complete parts, so you can begin using them instantly. Don’t worry if you don’t have a design for your metal part. Fotofab engineers are standing by and will happily use your handcrafted prototype, sketch on a napkin, or simply information about how the parts are supposed to work and where they need to fit. We will help design both the blanks and the tooling required to etch and bend the parts to their final shape. Fotofab most often uses kick presses which are ideal for this low-cost tooling and can be setup very quickly. Even when built quickly, our results are very precise and repeatable. Unlike the methods used by many prototype shops, the Fotofab method does not rely on the manual work of operators, but rather, robust tooling. This ensures the same result every time and is ideal for rapid prototype parts. In addition to the kick press operation, Fotofab also has several hydraulic presses. These are ideal for parts which require additional force for bending, such as thicker metals or parts that require drawing or coining. These presses can also be used for what Fotofab calls a One-Shot Tool. Unlike stage tooling which requires a separate operation for each bend, a 1-shot tool performs all operations in a single strike. These tools cost more than stage tooling but can pay for themselves in a lower part cost with adequate volume. The break-even quantity will vary based on the geometry of the part. Fotofab produces drawn cans in rapid prototype and production quantities. A drawn can is a seamless, 5-sided box with rounded corners, made by stretching or “drawing” the middle of a rectangular blank. They can be made from material .010″ to .040” thick with a draw radius of 2.5x thickness and finished with or without a lip along the bottom. They can be very inexpensive and are also ideal for hermetic applications. 4-Slide stamping is suitable for smaller parts (typically narrower than 3″) with a less complex feature geometry. The machine is a horizontal press with 4 moving tools which strike the metal part from different directions. By working on 4 axes it is able to be very versatile, and usually less expensive to tool than a progressive die. For the quickest and least expensive option, Fotofab recommends hand forming. Hand forming is ideal for parts at least .008” thick (0.2mm) with 90° bends and does not require tooling. To facilitate this, Fotofab etches a channel into the blank during which serves as the inside of the bend and ensures an easy and accurate bend. Fotofab can work with material thicknesses from .0001” to .125” (.0025mm to 3.175mm), depending on the features required. And just like the chemical etching process, our standard lead time is 1 week. Expedited lead times are available in as little as 1 day, even with new tooling!